When we have eaten well and take fat rich diet then in this condition Acetyl CoA produced from fatty acid breakdown will be gone to storage in adipose tissue or not? If it will go for storage then why and if not go for storage then what will be reason? As Roland mentioned in the comments, in the well fed state, not all of the Acyl coA is converted to Acetyl coA. This picture from Harper's Biochemistry, 29th, should come handy. 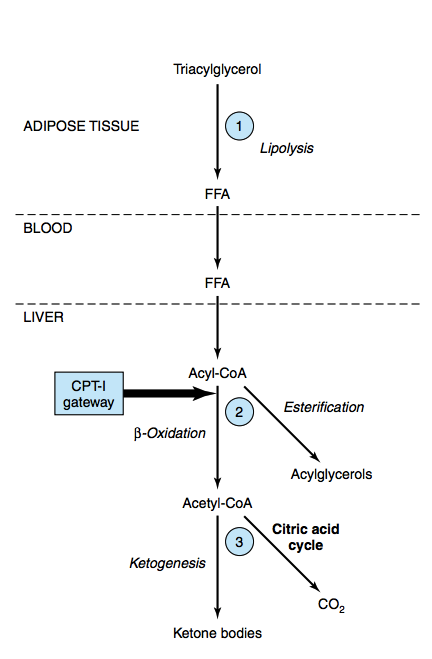 It is the CPT-1 gateway that regulates the amount of acyl-coA (from FFA) that enters into the mitochondria to form acetyl-coA. In the Fed state, the CPT gateway is shutdown (regulation by malonyl-CoA) - allowing esterification by sending them back as VLDLs. In the starved state, the gates open, leading to beta oxidation giving acetyl-CoA. The acetyl coA then can enter the Kreb's cycle to get completely oxidised and give ATP + CO2 (this ATP the liver readily utilises). Or, the acetyl-CoA can be channeled into ketogenesis, where this energy can be used by other tissues (since liver lacks the enzyme thiolase and hence can't metabolise ketone bodies). How the liver distributes the acetyl-coA for ketogenesis/Kreb's cycle is a different story altogether. Not the answer you're looking for? Browse other questions tagged biochemistry metabolism fat-metabolism fatty-acid-synthase or ask your own question. Is dietary fat directly stored in adipose tissue or is it immediately metabolized?